The trailer for Sony Pictures' UFO has been released online, and it actually looks like it could be an intriguing science fiction thriller. 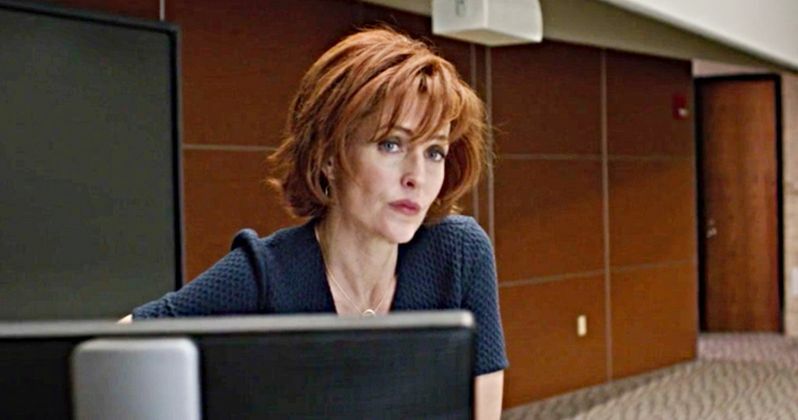 The movie stars Gillian Anderson, best known for playing Dana Scully in The X-Files, in addition to including a number of other talented cast members. The story of UFO isn't like most alien-themed science fiction movies, which typically send the main character off into space with the aliens, or at least feature a human encountering an alien on Earth like in E.T.. Instead, UFO seems to go the same route as Super 8 by putting the focus almost completely on the human protagonists who believe in aliens, with them most likely not encountering the aliens themselves until the third act of the movie. The movie's protagonist is played by Alex Sharp, who received a Tony Award for his stage work in The Curious Incident of the Dog in the Night-Time. The movie also features David Strathairn, who received an Oscar nomination in 2006 for his leading role in Good Night, And Good Luck. However, the biggest casting draw of UFO is Gillian Anderson, who received four Golden Globe nominations for her work in The X-Files as Dana Scully, with one win in 1997. The tone of UFO feels rather similar to The X-Files, so Anderson should fit right in with the rest of the movie, and will likely help improve the overall feel of things. The plot of UFO certainly looks rather interesting, with enough mystery and stakes to keep audiences entertained throughout the duration of the story. Here is the official synopsis of the movie. "Derek (Alex Sharp) a brilliant college student, haunted by a childhood UFO sighting, believes that mysterious sightings reported at multiple airports across the United States are UFO's. With the help of his girlfriend, Natalie (Ella Purnell), and his advanced mathematics professor, Dr. Hendricks (X-Files' Gillian Anderson), Derek races to unravel the mystery with FBI special agent Franklin Ahls (David Strathairn) on his heels." As an independent film, UFO looks to be rather low budget, but still entertaining. Considering that Gillian Anderson chose to be involved, this movie should have some high expectations to it. This looks like it will be the kind of science fiction thriller that keeps the genre intriguing, showing the possibility of alien invasions from new perspectives, this time from the point of view of a simple college student who believed he saw a UFO. Typically these types of characters are only used as plot devices in most other alien invasion movies, so it will be interesting to see this type of character become the protagonist. All in all, this movie from Sony Pictures Entertainment may not be a movie that science fiction lovers will want to miss. Not only is the return of Gillian Anderson to the science fiction genre truly exciting, but the entire narrative of the movie looks incredibly intriguing. You can watch UFO for yourself when it releases on DVD and Digital on September 4th, 2018.